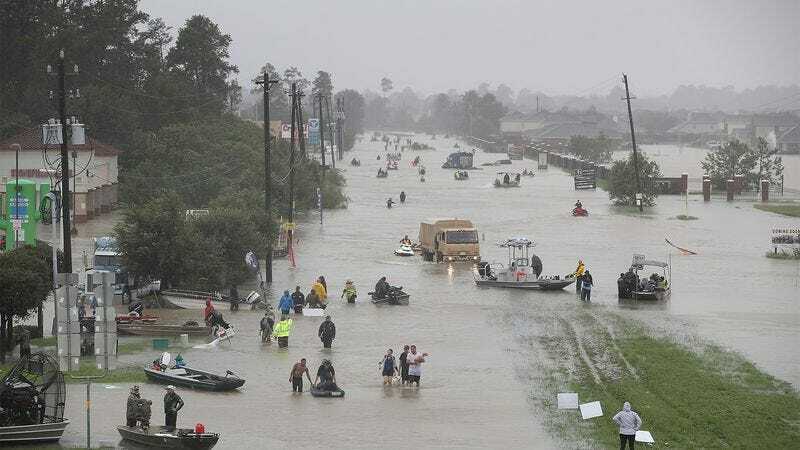 HOUSTON—Appearing shellshocked as they took in the scenes of devastation around them, Houston residents reportedly emerged from their homes Monday to survey the damage caused by 200 years of rampant, worldwide industrialization. “Oh my God. Everything’s destroyed, everywhere you look,” said visibly stunned citizen Chris Marciano, one of the 2.3 million locals who stared silently, buried their faces in their hands, or broke down in tears at the sight of entire neighborhoods and business centers that had been wiped out by generations of aggressive, unregulated expansion of mass production methods and transportation technologies and the resultant exponential growth in harmful gas emissions. “We’ve lost everything, absolutely everything. I’ve never seen destruction like this before. If only there had been some way this could have been prevented.” At press time, officials were urging citizens all along the Eastern Seaboard and Gulf Coast to prepare for similar emergencies, warning that the centuries of unrestrained global manufacturing growth that hit Houston could strike anywhere, any time.